Got to hand it to the gang at Facebook, updates to their apps are timely and ongoing. Facebook for iOS got updated to version 6.2 today and it brings a couple notable new features to the forefront. In addition to the usual host of whatever bug fixes were made, users can now start new conversations with photos that are received in messages. Another added feature is the enhanced ability to easily change who can see what you have shared. Not only are you limited to just “you” or your “friends” or “public.” This feature provides a bit more granular control to the user in terms of privacy. That is not such a bad thing nowadays. 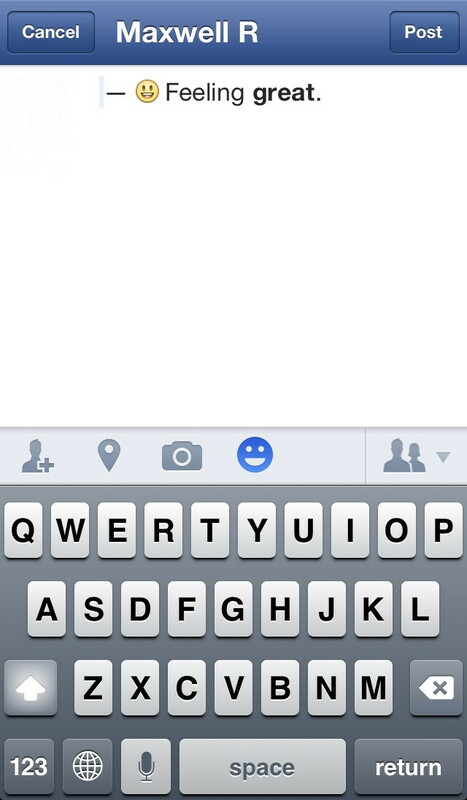 Finally, you can incorporate icons, or emoticons that are linked to how you are feeling when you post a status update. There are numerous categories too. Right now, the new icons are available only in English. Now we just need to sit tight and wait for when we will see hashtag support finally make an appearance on the social networking site. Who knows what other goodies they have in store for us. why can't Facebook do this with other platforms why IOS ?